When the first Star Wars movie hit theatres back in 1977, movies and even popular culture were changed forever, with millions wowed by George Lucas’ epic space opera. But Star Wars also made a Death Star-sized impact on the toy world, which within the year after the release of the first film found itself awash with figurines modelled after Han Solo, Luke and other characters. Children raced to get their hands on one of the 3 ¾ inch action figures and complete their collections. Now, some 35 years later, those figurines can go for the toy-world equivalent of a Jabba the Hutt-sized ransom. Here are the top five most valuable Star Wars toy pieces. The first wave of Star Wars “early bird” figures landed on the toy market in 1978. The original Darth Vadar, Luke Skywalker and Obi-Wan Kenobi figures came complete with a telescoping lightsaber accessory. This was later replaced by a single piece lightsaber, and for a good reason – the telescoping lightsaber would extend from the figure’s hollow arm, and then had another, thinner piece extend out that easily broke. Of this original run, the Darth Vader figure is the most sought after, with legend having that only a few hundred of the entire early bird line being manufactured. The Darth Vader figure goes for about $6,000. 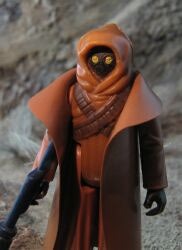 The original Jawa sand-dweller figures arrived on store shelves with a cape made of out of thin vinyl, like the cape on the Vader and Luke dolls. But this vinyl cap was replaced in the next round of Jawa figures with a cloth robe. It’s said that manufacturer Kenner added the cloth robe to compensate for the smaller size of the Jawa dolls. But now the original vinyl cape version goes for $2,000 on average. The 1980 figurine for this infamous bounty hunter is a bit of Star Wars toy lore. Fans debate whether the figure really exists, since the manufacturer pulled it over worries the fireable missile on Fett’s back would pose a safety hazard. Kenner denies they ever made the toy but a few have popped up on the collectors market for between $1,000-$2,000. 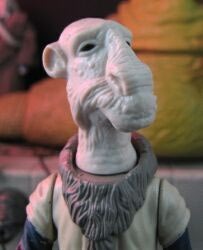 Kenner’s line of Star Wars figures was cancelled in 1985. Their last doll was the odd-looking Yak Face.Despite going through production it never hit U.S. store shelves, but the supply was instead sent to toy outlets in Canada and Europe. Because of this, the rare figurine can be had for an average of $1,000. Another one in the original Kenner Star Wars toy line, this blue Snaggletooth doll was made blue by mistake, as the toy designers didn’t have a picture of the movie Snaggletooth character to reference, who was instead red. They realized their mistake and canned the figure, but lucky collectors can find it still for roughly $400.